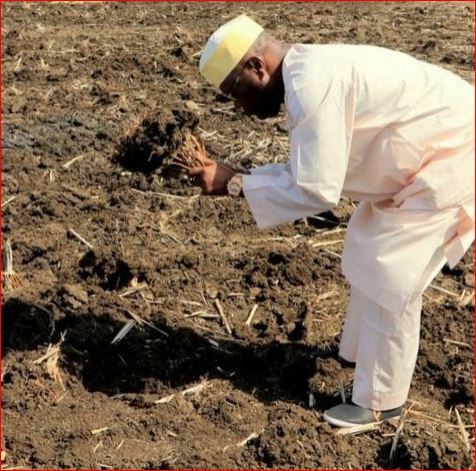 For attempted farming on Twitter, the former Vice President of Nigeria, Alhaji Atiku Abubakar is now at the receiving end for sharing his farming picture on Twitter, reports ITRealms. Investigations by ITRealms showed that on Wednesday, June 21, 2017, Abubakar at 9:42am tweeted a picture of himself entitled ‘farming season,’ but instead of getting thumb up, the tweeps are attacking him with venom from angry Nigerians. Some of those who responded to the tweet told him that real farmers do not have the time to snap pictures for Twitter posting. "Real farmers are busy in the farm not on Twitter. Real farmers don't dress in Agbada," one of the critics, @gentle_Chika said. For @OmoAyeni, it was the question time; "what are we planting this time, another seed of corruption?" Also for El Nino, wondered the farming season with which dress. As said by him, "The real farmers who feed Nigeria cannot even afford d cost of his cap to put cloths on theri back." Yet for Dafidi @Molade87, this picture depicts "Operation Fool the Nation" saying its another Atiku's deceptive strategies to make myopic and gullible Nigerians vote for him in 2019. Sean Omo_ni_gho, declared that there is no place where farmers plant with agbada dress and Rolex. @Realking-Kesh asked if Atiku is not farming for his stomach, wondering how that caused the reduction in food prices in the Nigerian market? "no be ur belle u dey farm for? hw dat one take reduce price of foodstuffs for market? U dey even farm with that kind wristwatch sannu?"